We’ll be rolling down the turnpike this weekend to attend the Arts Festival Oklahoma on the OCCC campus (would that be the OCCCc?). This is a new festival for us, but we always have a good time when we scoot down the turnpike to the OKC area. I’m making good progress on my Pecan Grove Scarf and hope to have it finished this weekend, either on the way to the festival or while there. Yes, expect some public knitting at the Arts Festival Oklahoma this weekend! 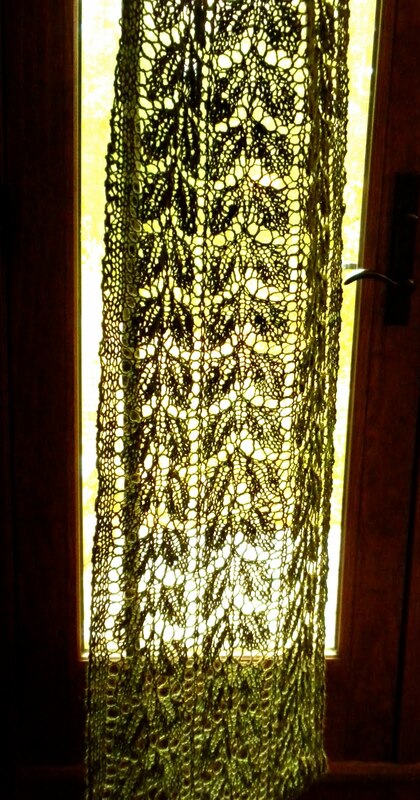 For back up knitting, in case I get Pecan Grove finished, I’ll be taking my Brandywine Shawl. And maybe I’ll toss my Nutkin socks in too – they take up so little room. Night before last I thought I’d block Pecan Grove just to see how it was coming along. Pretty good huh? The pattern is charted and being tested currently. There was groaning involved but I was not about to put Icarus away again without correcting the problem first. After several hours Icarus was back in order. One step forward and two steps back… Is that a country western line dance maybe? If you come by our booth this weekend in OKC – please don’t mention Icarus. What to take for Turnpike KnittingWe’ll be rolling down the turnpike this weekend to attend the Oklahoma Arts Festival on the OCCC campus (would that be the OCCCc?). This is a new festival for us, but we always have a good time when we scoot down the turnpike to the OKC area. I’m making good progress on my Pecan Grove Scarf and hope to have it finished this weekend, either on the way to the festival or while there. Yes, expect some public knitting at the Oklahoma Arts Festival this weekend! For back up knitting, in case I get Pecan Grove finished, I’ll be taking my Brandywine Shawl. And maybe I’ll toss my Nutkin socks in too – they take up so little room. Night before last I thought I’d block Pecan Grove just to see how it was coming along. Pretty good huh? The pattern is charted and being tested currently. While it was on the wires I pulled out an UFO. I hesitate to call it a WIP because it hasn’t been out of it’s designated knitting bag for some time. There are less than two dozen rows left to finish my Icarus. The next row was a WS rest row, only a few knits along with the purls. That’s a good way to ease back into a project, even a project with several hundred stitches. That done I plopped over the big blue thing to start row 9 of the last chart. I told you it’s nearly finished! What I soon realized was that row 7 had errors. Errors that prevented me from moving forward, and could only be fixed by – – – tinking back. Tinking back two rows and what may well be 1000 stitches. (I’m refusing to count. It may hurt. )There was groaning involved but I was not about to put Icarus away again without correcting the problem first. After several hours Icarus was back in order. One step forward and two steps back… Is that a country western line dance maybe? If you come by our booth this weekend in OKC – please don’t mention Icarus.